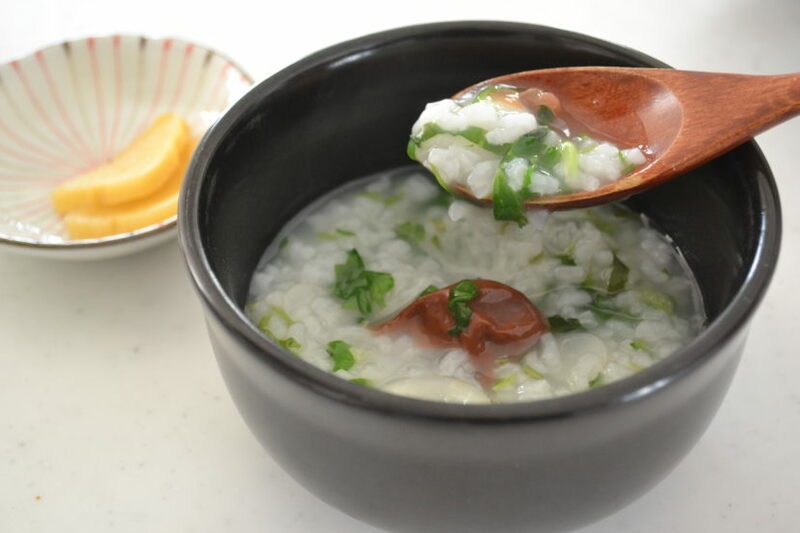 We eat this healthy rice porridge on 7th of January to take good care of our body, based on Eastern medicine. During the holidays, our digestive organs keep working for continuous, too much festive feast. Eat the porridge to reset your appetite! Rinse your rice until the water runs clear. Transfer to an earthenware pot or heavy bottom pot. Add a pinch of salt and water. Turn the heat to medium-high until it starts to boil. Stir to separate the grain if it is stick each other. Lower the heat to the lowest possible temperature, put the lid on and simmer for 30 minutes or until cook through. Each grain should keep its shape, and not too soft when it finish cooking. While simmering, Chop the herbs into small pieces. Here is the list of the seven herbs. ・Seri：Water dropwort ・Nazuna ： Shepherd’s purse ・Gogyo: Cudweed ・Hakobera : Chickweed ・Hotokenoza : Henbit ・Suzuna : Tunip ・Suzushiro : Daikon raddish※I think the watercress or arugula is a good substitution. Add into the pot and stir to distribute evenly. Turn the heat off and put the lid on and let it cook with the remaining heat. Set aside while preparing the sauce. Add all the ingredients of sauce in a pot. Turn the heat to medium-high, constinuously stir until comes to boil. Turn the heat off when the mixture thickens and translucent. Let’s take a look at the porridge. It smells like a little bit of medicine and become greenish. Transfer to a bowl and ladle over a generous amount of sauce. Put a small amount of grated ginger for the final touch. It’s so hot that burn your mouth so be careful! Alternatively, serve with Umeboshi the Japanese pickled sour plum. It helps digestion as well. The combination of rice porridge and Umeboshi is the staple when you get sick, like chicken soup in America. The porridge tastes little bit bitter but flagrant, the texture is so soft and comforting. The savory sauce add flavor to it and it makes the porridge so special. Adding the sauce is my kind of arrange, and it so good! Each herb has different medical effect and function. Also the herbs considered as lucky charms as well. You can use any kind of herbs of your favorite. Give it a try and let me know how you like it! How to make★Miso dzuke★Japanese Miso marinade fish, chicken and pork~100 video give away! Welcome to Kitchen Princess Bamboo! I am Akino Ogata, chef of this site. I was born and raised in Japan and have been interested in food since I was a child. I am running a small pastry shop for 13 years in Nara, the oldest palace city of Japan. And I teach cooking at my kitchen since then. I would like to share my knowledge which I learned from my family, customers and students. Here I introduce authentic Japanese recipes to bakings that I develped for a long time. Most of them are easy to make! I hope you will find your favorite and enjoy cooking!